Today I want to talk to you about wholesaling, and why so many fail at it as an exit strategy. Now I’m not trying to get down on you wholesalers out there, but there are ways to improve and do better in the marketplace. This isn’t meant to be a negative episode, it’s meant to be CONSTRUCTIVE and help you solve more problems in your area. What is a wholesaler’s job? Most people, even wholesalers themselves, don’t know. Many think they have to begin as a wholesaler in order to start making money in real estate. That’s simply not true; wholesaling is an EXIT STRATEGY, not an identity. You are a real estate investor who found a problem property that doesn’t meet your criteria. A wholesaler’s job is to negotiate discounted real estate purchases for buyers from MOTIVATED sellers. Your job is not to manhandle the property from a seller or try to finagle a steep discount on an MLS property. A wholesaler MUST be seller-direct; otherwise, you’re wasting everyone’s time. You have to be direct. Working with a realtor is NOT direct. You can’t work directly with a seller if you’re having to talk through multiple channels. In short, don’t bother with realtors if you’re looking to wholesale a property. Bottom line: You should be finding properties for buyers, NOT the other way around. Solve problems, don't create new ones. Don’t forget to join our Facebook community at CashFlowGuys.com/Community. 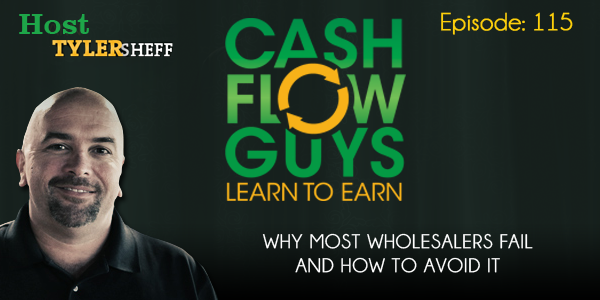 If you want specific videos on a topic, visit CashFlowGuys.com or email us at info@CashFlowGuys.com.